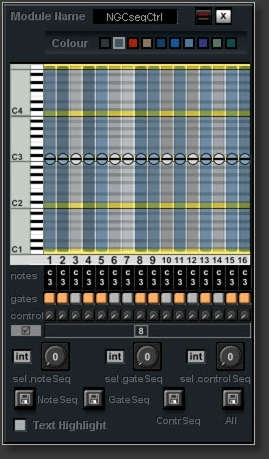 For consecutive order, sequencer modules have to be synchronized by a ramp (sawUp) signal. Either use a Ramp module (see below) or a ramp wave in your DAW (connnected to 'rp' input of seq module - not to audio mixer (ear/speaker damage). Provides ramp signal to audio seq modules. This module has to be triggered by a gate signal. Up to 128 different sequences can be stored and recalled using the SelectSeq control or an external control signal. Sequences can also be stored/recalled by using the PrsetList. With Glide control to smoothen hard transitions. With Swing and StepLength controls. Connect it directly to an Osc. Connect it to a PitchModifier module (eg PMod2mLD), with modulation level fully turned up. These modules make rhythm and melody programming easier. remote control for a note/pitch and gate seq modules. Up to 128 different gate and note/pitch sequences can be stored and recalled using the SelectSeq control or an external control signal. 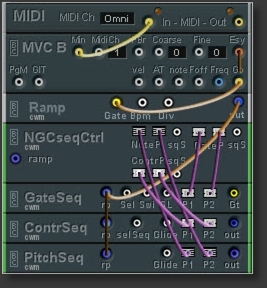 preset lists for note/pitch and gate values. as above, but also with Control remote control. preset lists for note/pitch, gate, and control values as well as all values together. important: for external control, connect Pipes only to NG/NGC Note/Pitch pipes , not to the 'usual' pipes , as Note/Pitch pipes have a different range.